You need more major donors, right? And lately it seems like mid-level and major gift fundraising is all the rage. The experts are hammering the point home that smaller nonprofits aren’t raising major gifts (duh). And there’s seemingly been an influx of major gifts fundraising classes, too. Of course, who wouldn’t want Oprah or Ellen to notice their organization and put them on the map? Or have the local billionaire step up, out of the blue, to write a check? But you know better, don’t you? Fundraising isn’t about asking rich people for money. Fundraising is about the systems that take your first-time donor…to lifetime donor. Your organization’s major donors are, after all, right in your backyard. Yep, they’re already in your donor database, and you’ve just got to know how to work them. Here’s the 411: if you’re not honoring your first-time or small donors, if your systems are broken, you’re going to have a hard time getting from here…to there. What does your donor experience when she makes that first online gift? What if it’s “only” a $10 gift? What systems do you have in place to understand your new donor’s motivations, and bring in the second gift? 1.Are you getting your thank you letters out promptly (even for online gifts)? Is it the kind of thank you letter that has the ability to really “wow” your donors, or are you half-assing it? Download your thank you letter template and worry no more. 2. Are you making those donor thank you calls, particularly for your first-time donors, and are you doing it on the regular? 3. What does your thank you email look like? Is it a receipt, or is it actually a meaningful communication that reinforces the simple truth to your donors: that they are wonderful? 4. Have you thought about your donor’s motivation for making a gift? What about including a text box on your donate form, like SolarAid? Smart move. 5. What systems do you have in place for welcoming new donors? We’ve got examples of welcome kits here and here. 6. Which donors have the capacity – and more importantly, the commitment – to become major donors? Look within your database. Typically 10-20% of your donors are responsible for 90% of individual giving. Resolve to focus a minimum of one hour a week on these donors. Download Creating Strategic Plans & Goals for Every Major Donor and create a Marketing Impact Chart for your first prospect. 7. Get your board and staff involved in the gratitude process, because it’s everyone’s job to be totally present when it comes to communicating thanks to the supporters who make your wonderful work possible. Take a look at this thank you! As Bloomerang’s Jay Love notes in his recent post, there must be a focus on moving new donors to repeat donors. “It is nearly a TRIPLING of the donor retention rate once a donor gives for the second time! If you calculate donor lifetime value, your organization will see dollar amounts that could revolutionize your mission impact! Take a cue from Britany’s Hope Foundation. Three years ago, during a session of mystery shopping, I made several online gifts to a number of small nonprofit organizations, and Britany’s Hope was one of them. Imagine my surprise and delight when I received a thank you phone call, merely 15 minutes later, from their Executive Director. The crazy good feelings and vibes didn’t even there, though, and neither did my giving. I’m now a monthly donor at the $35 level. Though I’m far from being a major gift supporter by any nonprofit’s standards, Britany’s Hope makes me feel like a major donor, because they’ve cared about our relationship from day one. “No matter the gift (large or small), all gifts are important and special to us here at Brittany’s Hope. Whether we receive a donation for $35 or $5,000 we make sure we recognize, thank, and welcome all those who support us. Of course, a large donation warrants a detailed report and may be recognized with naming rights (i.e. project plague), but a continuous monthly support is just as valuable in our eyes. This may sound cliche, but our communication and place of importance are equally the same for all our donors regardless of dollar amount. The term “small donor” is never used here at our office when segmenting our donors; quite simply we do not measure our donors based on the dollar amount rather on their vested interest, time, talent, passion, and resources. In many cases, what could be considered as a “small/mid-size donor” typically gives a larger percentage of their income than “large” donors. Also, at our organization, this group holds the highest retention rate and our strongest advocates in spreading the mission. That is not to say one donor segment is more important than another; rather all donors represent a different quality and attribute, therefore all deserve the same time and respect. Do you see what I mean now? 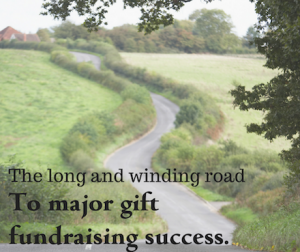 I’ve just given you the tools to begin your organization’s major gift fundraising program. Every donation, even your $10 donor is an opportunity for so much more, if only you take the time to really reach out and nurture those amazing possibilities. Work with what you’ve got, and maximize the potential of each and every human being your organization comes into contact with. Yes, human beings — not dollar signs. What systems do you have in place for new donors? Fab questions Pamela. Picking up on Mai-Lynn’s principle of treating all gifts as important, I’ve also learnt that you don’t know who people know – so impressing someone who has given a ‘small gift’ in such a way they talk about it to their friends might open doors to something else (so it is totally strategic as well as the right thing to do). I also know of a charity in the UK who recently thanked a new donor for starting a regular donation of £5 a month with a handwritten card – only to learn it was a test to see how the handful of charities the donor had given to responded. They were duly awarded the subsequent corporate partnership worth significantly more. When you understand the power of storytelling, combined with the power of genuine donor love (not lip service), you can harness the strength of small donor numbers. Previous post: What’s in my Mailbox | One of the best direct mail packages I’ve ever seen…thank you, Sheena! What’s in my Mailbox | One of the best direct mail packages I’ve ever seen…thank you, Sheena!